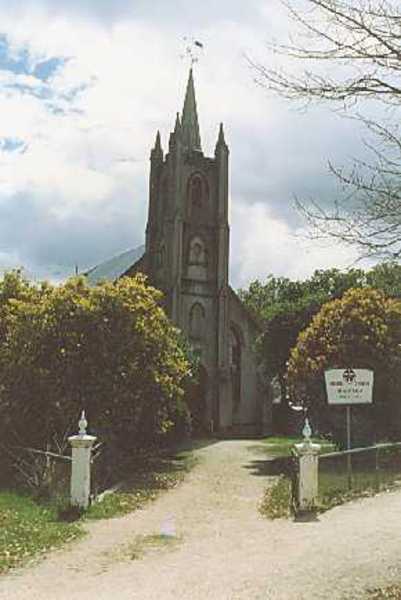 The former Presbyterian church was erected in 1857 By Smith, Bank and Cranston. The architect was ThomasTurnbull. The rendered brick hall church with buttressed walls and lancet windows with label mouldings is dominated by a square tower with a short spire. The tower has pairs of tiered buttresses in each corner which are surrounded by pinnacles. The exposed brick Sabbath School was added to the rear of the church in 1883. This is one of the finest gothic revival churches in Victoria. It is simply composed and decorated and derives its importance from the superb tower, which is perhaps unique in the State. The slim tiered buttresses, the pinnacles and spire are distinctive features. The church itself is also important, with its matching buttresses and intersecting arch window tracery. The building survives from early times and contrasts notably with the massive solidity of Christ Church. It is an outstanding element in the town. The present wire fence is not compatible with the church. Historic Area: Beechworth is a picturesque nineteenth Century provincial town. It is a well preserved mix of Government and private buildings, resulting from the town's important historical role as the administrative and commercial centre of Victoria's north - eastern goldfields. Beechworth was also significant for its position on an early overland route from Melbourne to Sydney. The town is sited sympathetically to the topography, in an area of considerable landscape interest. Set in forested undulating country, there remain many relics of the mining era in and about Beechworh. It is a rich field for industrial archaeology. There are, within the town, a large number of historical and architecturally significant buildings. These display a quality of form and richness of material and detail which make Beechworth one of the most significant of Austraila's goldfield towns. Of particular interest is the common usage of local granite in construction, with its honey colour imparting a quality distinctive to Beechworth. Highlights of Beechworth include the grid of wide streets flanked with granite kerbing; the streetscapes of considerable integrity with homogeneous buildings set off by mature elms and other exotic trees; and the remnants of historic Victorian gardens. About the town there are many examples of nineteenth century street furniture, signs and fences. Beechworth's historical wealth is of national significance.